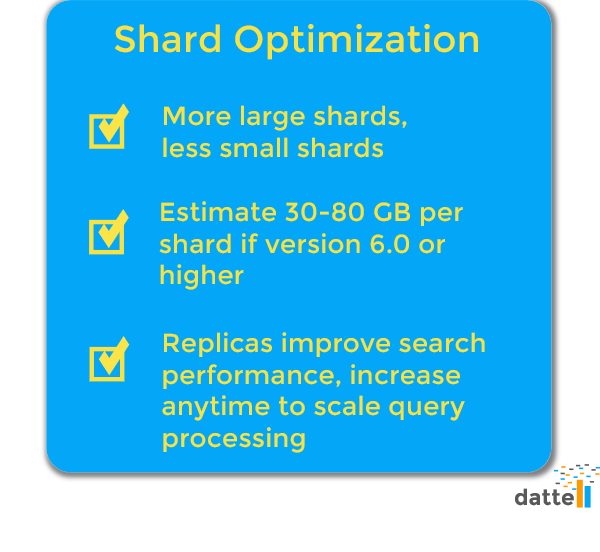 Optimizing Elasticsearch for shard size is an important component for achieving maximum performance from your cluster. To get started let’s review a few definitions that are an important part of the Elasticsearch jargon. If you are already familiar with Elasticsearch, you can continue straight to the next section. Anytime there is a collection of documents in Elasticsearch, it is referred to as an index, and each index is typically split into sub-elements referred to as shards. These shards are then distributed across multiple nodes in the cluster. Elasticsearch automatically manages and balances how the shards are arranged in the nodes. Elasticsearch also automatically creates five (5) primary shards and one (1) replica for every index. We recommend that our clients have one (1) replica in every production cluster as a backup. Beyond serving as a backup, the replicas also aid in search performance, providing higher throughput and additional capacity. You can add or remove replicas at anytime to scale out query processing. Unlike replicas, shard allocation cannot be modified later. So without further ado, let’s dig into shards. Determining shard allocation at the get-go is important because if you want to change the number of shards after the cluster is in production, it is necessary to reindex all of the source documents. If you are new to Elasticsearch, just know that reindexing is a long process. You might be thinking, “Just allocate a crazy number of shards so that’s never a problem, right?” Not quite, like all things in life there needs to be a balance. Each new shard comes with a cost, taking up memory and CPU resources. Additionally, keep in mind that each search request will require an interaction with every shard in the index. If shards are competing for the same hardware resources (that is part of the same node) then this will impair performance. Using the 30-80 GB value, you can calculate how many shards you’ll need. For instance, if you think you will be reaching 600 GB in the next two years, then you will want to allocate 10 to 20 shards. Typically it is better for performance to have a fewer number of large shards, as opposed to a large number of small shards since each shard will take up a finite amount of resources. In the classical scenario, you would have one (1) shard per index, per node. So if you aren’t sure of your expected growth, then a good starting point is to estimate the number of shards as 1.5 to 3 times the number of nodes in your starting configuration.